The Show or Display list includes a 1997 Porsche GT1 Straßenversion, and a 1998 Porsche GT1. According to Wikipedia, twenty five 1997 Straßenversions were built, only one 1998 GT1 "street version". Under 500 cars, technologically significant, meets the requirements for Show or Display. The 1998 Porsche GT1 would still need to meet US EPA requirements, but being based on the Porsche 3.2 twin turbo engine, makes the job of certification easier. "Regulations for the GT1 category stipulated that to be eligible, a total of 25 cars must be built for road use. Porsche developed a fully road-legal version, dubbed "911 GT1 Straßenversion", and delivered one in early 1996 to the German government for compliance testing, which it passed. The engine had to be slightly de-tuned to meet European emissions laws, although its 544 PS (400 kW; 537 hp) and dry weight of 1,150 kg (2,535 lb) proved to be more than adequate; the vehicle could accelerate to 100 km/h (62 mph) from a standstill in 3.9 seconds on its way to a top speed of 308 km/h (191 mph)." "For the 1998 season Porsche developed an all-new car, the 911 GT1-98. Designed to match the also new Toyota GT-One and Mercedes-Benz CLK-GTR, the 911 GT1-98 featured bodywork which bore more of a resemblance to traditional sports-prototypes than the previous 2 models while a new sequential gearbox was installed. 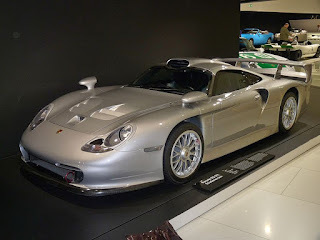 As per the regulations a street-legal version of the 911 GT1-98 was spawned, but it is believed that only one variant was produced which was still sufficient to satisfy the regulations."